Defines consumer classes for the MIDI Kit. Defines the Baseclass of all MIDI consumers and producers. Defines producer classes for the MIDI Kit. Defines the heart of the MIDI Kit: the MIDI Roster. 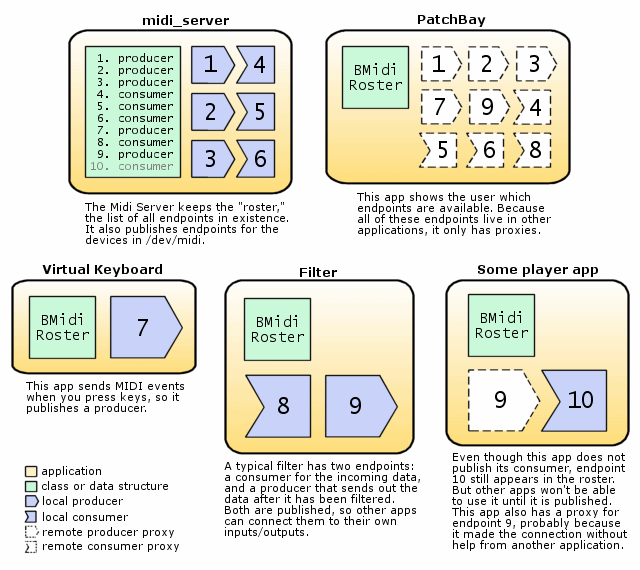 The Midi Kit is the API that implements support for generating, processing, and playing music in MIDI format. MIDI, which stands for 'Musical Instrument Digital Interface', is a well-established standard for representing and communicating musical data. This document serves as an overview. If you would like to see all the components, please look at the list with classes . BeOS comes with two different, but compatible Midi Kits. This documentation focuses on the "new" Midi Kit, or midi2 as we like to call it, that was introduced with BeOS R5. The old kit, which we'll refer to as midi1, is more complete than the new kit, but less powerful. Timing is now specified in microseconds rather than milliseconds. This also contrasts with the old Midi Kit's conception of a BMidi object, which stood for an object that both received and sent MIDI data. In the new Midi Kit, the endpoints of MIDI connections are all that matters. What lies between the endpoints, i.e. how a MIDI filter is actually structured, is entirely at your discretion. So what can you do with remote objects? Only what BMidiConsumer, BMidiProducer, and BMidiEndpoint will let you do. You can connect objects, get the properties of these objects – and that's about it. The constructors and destructors of most midi2 classes are private, which means that you cannot directly create them using the C++ new operator, on the stack, or as globals. Nor can you delete them. Instead, these objects are obtained through BMidiRoster. The only two exceptions to this rule are BMidiLocalConsumer and BMidiLocalProducer. These two objects may be directly created and subclassed by developers. Please have a look at the introduction for a more comprehensive overview on how everything ties together. Defines the status codes for MIDI Server notification messages. These codes are used when you request notification as in BMidiRoster::StartWatching(). Check against these codes to determine what is happening. See the StartWatching() method for a more complete description of the codes and their meaning.